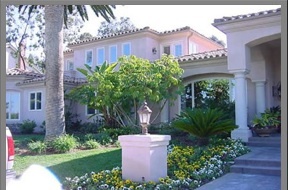 We work with homeowners, real estate agents, and HOA associations as well as a few commercial properties providing landscape services and landscape construction in San Diego County. Including commercial landscaping, backyard landscaping, and landscape maintenance. Our hourly rate is charged for meetings, phone calls and travel time to a client location ( we only charge for one-way and not round-trip) data entry and design time. We offer a free one-hour consultation usually within a 25-mile radius of Downtown San Diego. At an initial meeting, we will interview each other to see what we can offer the client as well as the client telling me what their needs are. Construction and Design Management – This is the service that most clients will hire us to perform. We create a digital drawing for client review illustrating the overall scope of work. As needed we secure labor, order the materials and are present on-site to manage the installation of all. We can meet with clients a the nursery to select plant materials for the project. Plant Consultation – We are able to identify and diagnose most problems and suggest possible solutions. Design Review – If you already have a design plan from another designer or architect, we can offer recommendations on the design and suitability of the plant materials. Home and Yard Staging – We have worked with many homeowners and Real Estate agents to get a house ready to be put on the market for sale. Maintenance Consultations – We have performed all aspects of lawn and garden maintenance for over 18 years. I offer a one-time review or an ongoing consultation service working with the clients’ current maintenance company or suggesting alternate companies to perform the service. Estate Management – Ongoing management of exterior repairs and maintenance management through plumbers, electricians, pest management and other tasks. Irrigation Reviews – We analyze and make suggestions on optimizing water use to receive the maximum benefits. We have installed hundreds of new irrigation systems and repaired and upgraded hundreds more. Landscape Lighting – Numerous options are currently available to provide atmosphere and a dramatic look and safety to your landscape. Special Events – We can provide simple or extensive yard upgrades for events like weddings, parties as well as holidays. Interior Design – See our page Interior Design for more information. Interior Plantscaping – One of our core services since our business began, Plant selection and service company recommendations. We provide quality landscape designs and implement your chosen design with impeccable detail and care. Check out our portfolio and photo gallery to see and read about some of our past projects and be sure to contact us to get started on your next landscape project. We look forward to hearing from you soon. We invite you to browse our serivces below. Photos of client properties. Our work speaks for itself! Check out the recent articles posted here with the Layers Theme and keep up to date with the latest news along with great photographic imagery that shows the great things in nature.